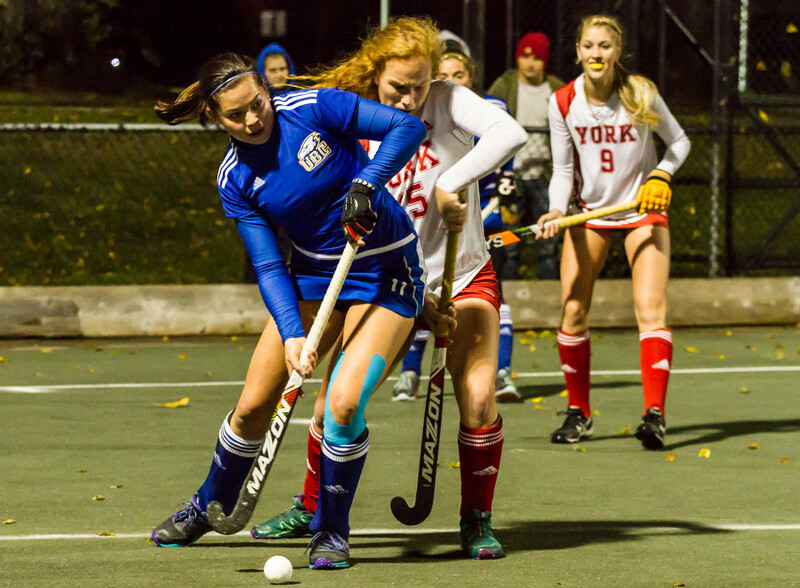 The UBC Thunderbirds didn’t disappoint in the first game of this year’s U Sports Championships, being held right here on campus at Wright Field. In what was easily the most difficult game they’ve played all year, the ’Birds snuck away with a well fought and well deserved 2-0 victory against the York University Lions. Conditions for the game weren’t what the team is used to either, as the temperature dipped below the freezing point by the 6 p.m. start last night, making the field slick and slippery for the game. “Conditions weren’t ideal and each team had to battle it out. Thankfully we were able to come through with the win,” said UBC forward Abbey MacLellan, who was awarded player of the game in the match. Going into the game, both teams had absolutely dominant seasons in their respective conferences. Each team had a balance between good offence and defence — it would take a lot for either side to get that important first goal in the championships. Throughout the first half on Friday night, play stayed in the middle of the field with both teams battling it out — possession was constantly changing. Near the end of the half, the ’Birds started to make a push for a last-minute goal against the fatigued York players. 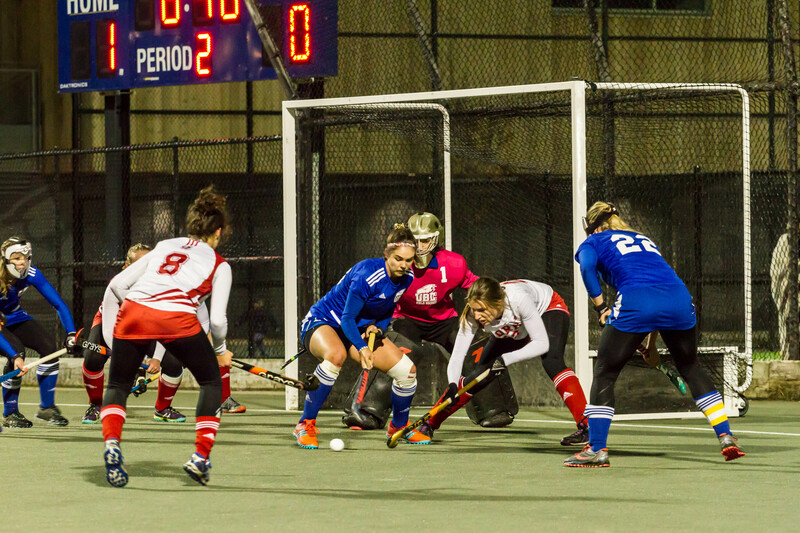 In the dying seconds of the 36th minute, UBC’s Niki Best would break the goal drought, pushing through to the net before finding the back of the goal and giving the ’Birds a 1-0 lead going into the second half. Best’s last-minute goal jumpstarted the ’Birds, who took control of the game in the second half. “We were able to stick to our game plan and work together, especially once we got that first goal it really brought the momentum up,” MacLellan said. That momentum continued to increase for UBC despite some close calls, including a York drive right at the goal that left many thinking they had scored, before the umpire waved it off for not having crossed the goal line. UBC’s added pressure in the second half finally payed off with just under five minutes to go in the game. 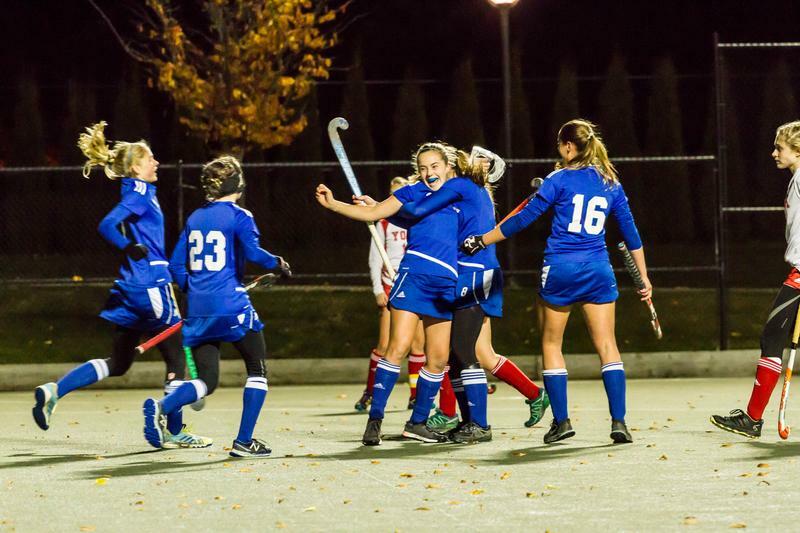 With MacLellan and Sophie Jones playing their way through York’s defence, Thunderbird rookie Jordyn Faiczak would be the beneficiary of their work as she got on the ball and hurtled it past York’s keeper to assure UBC the opening game win. UBC also played a strong defensive game, fending off numerous counterattacks and dangerous corners from York throughout the game. In net, UBC keeper and U Sports player of the year Rowan Harris recorded yet another shutout — the team’s fifth of the season. “I think our defence [from] the whole team was really good this whole game. Starting with our forwards, I think our press was really good. Our defence did a really good job once we got into the defensive edge of the circle,” Harris said. The ’Birds will play York again tonight at 4 p.m. at Wright Field. Should a third game be necessary, it will be played Sunday evening. In preparation, UBC is hoping to take as much momentum from their big opening win into game two. When asked about the game plan for Saturday, Harris pointed out that they’ll do the same things as this game, with minor adjustments if needed. “We’ll look at the video, go over [it] and see if there are any little tweaks … that we can make, but we’ll stick to the game plan,” she said. If UBC win on Saturday night, they’ll be crowned U Sports national champions for a record seventh straight season.